Australian passenger and freight movements are currently powered primarily by the burning of 300 million barrels per year of oil and LPG in inefficient internal combustion engines. Oil is a growing expense which, under BAU, will cost the Australian economy ~$1.3 trillion (2010 dollars) between 2010 and 2040. Oil imports have grown since Australian domestic oil production peaked in 2000. Australian domestic oil production is now in decline and this is projected to continue. 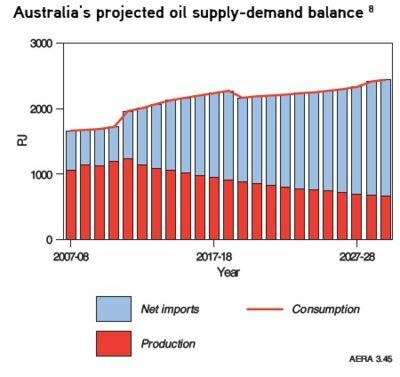 Forty percent of the crude oil consumed in Australia is imported, adding $15.7 billion to the 2007/2008 current account deficit.